By adapting customer satisfaction and marketing tools to its target business sector, Loytrend is developing customer loyalty strategies to enable stores, franchises and large companies to boost their revenues and enhance their brand identity. * Compared to January 2015. ** Calculated based on the increase in total turnover. MailUp is crucial for cultivating relationships with loyal customers by informing them of promotions and updates. What’s more, by integrating MailUp to our loyalty platform, we can add key data to emails such as card point balances to emphasize value and benefits. To collect new email contacts and telephone numbers for sending out loyalty campaigns. To retain customers by sending targeted and profiled campaigns. To create and launch omnichannel communications (both offline and online). Stores, involving an extensive membership campaign. Emails, with the launch of the campaign to all CVG members. Social networks, to spread the promotion and boost subscriptions. SMS, to reactivate CVG members who had made no purchases for at least 6 months. SMS was shown to be crucial for the strategy’s success, as the CVG target was particularly responsive. To the 20 thousand SMS sent with MailUp, as many as 5,500 contacts reacted by going to their nearest store. What’s more, by comparing the results of the mailings sent from the MailUp platform with sales data recorded on each customer’s card, CVG was able to accurately measure the campaign’s conversion rate. Calculate the purchase frequency and average sales receipt of registered customers. Create ad hoc promotions and encourage new purchases by registered customers. 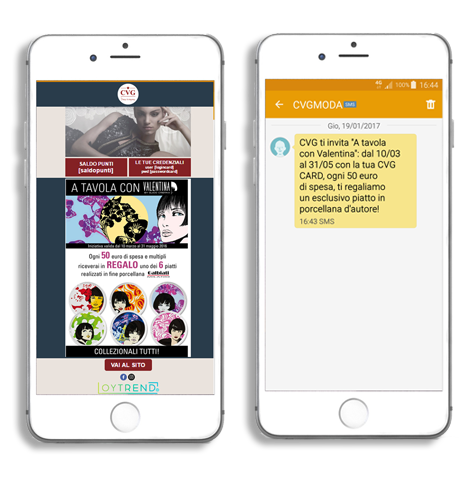 Develop the promotional strategy by making email and SMS work together. Monitor the recipients’ behavior, both before and after mailings.